It's time to introduce you to another fantastic SASI stamper! This week Our Friday Friend is Jennifer Hollett better to known to many of her friends as Otter (otter005 on SCS). 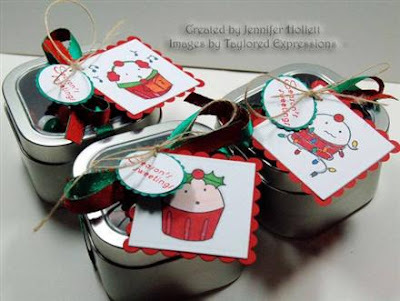 Her cute little M&M's tins will make such great Christmas gifts and favors! Visit Otter's Gallery and her Blog I Otter Be Stamping! and leave her a comment or two! I started Stamping about six years ago. I was invited to a SU! party, by a co-worker and walked out $300 lighter!! Yes $300! I can honestly say "I have not BOUGHT a card in six years!" I've grow up in a crafty family. My parents did craft shows for as long as I can remember. So it was only a matter of time before I found my own little niche of the crafting world. I am a VERY simple stamper. I like straight, clean lines, not a lot of layers. I typically go for cutesy images, which is why I was drawn to SASI. I originally saw Jessie's artwork via Bakerella's Blog, loved it there, and literally screamed out loud when Taylor gave us the first sneak peak of SASI stamps!! "So far" (notice the quotation marks) my favorite is Holly, but "Edward" (that's what I call him, and you Twilight readers will know who I am talking about) is a close second!! My mom makes the best fudge! It is a hard sugary fudge, not the soft type. Melt two squares baking chocolate and 2/3 cup milk over low heat until the milk turns chocolaty. Add two cups sugar, and a dash of salt. Boil this to a Soft Ball stage. Remove from heat, add two tablespoons of butter and 1/2 teaspoon of vanilla, stir until dull.Pour into a jellyroll pan that has been greased with butter. Allow to cool. Slice when cool. THANK YOU JENNIFER FOR BEING OUR FRIDAY FRIEND!!!! Don't forget to hop over to Taylor's blog to play today's Cupcake Challenge! And are you signed up for our Newsletter mailing list? Get all the latest news and special TE coupons! Enter your e-mail address under Join Our Mailing List in the sidebar so you don't miss a thing at the Taylored Expressions store! Congrats Jennifer! Those tins are so wonderful! Great Job! Otter, your M&M tins are just adorable! LOVE your clean line style, Girl! I love the tins Otter!!! WOO HOOO to seeing you as Friday's Friend, too!!! Super cute treats! Love the colors. TFS! I LOVE OTTER even more than I love her M&M treats! WOOHOO! wooHOO Otter! You blow me away with your creations and these tins are A-DORABLE!!! Otter these are fabulous!!!!! Love your tins!!!! ROCK ON OTTER BABY!! YOU DA BOMB GIRL!! !